a medium to large dog of compact build, with a coarse, fawn or gray coat, and a docked or naturally short tail. The coat forms a characteristic beard and mustache. The breed is affected by an inherited laryngeal paralysis. Called also Belgian cattle dog. 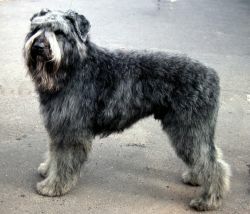 Bouvier des Flandres with uncropped ears.